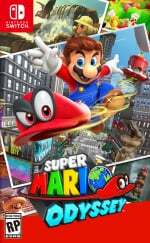 Super Mario Odyssey is getting closer, all set for a 27th October release. As is its way Nintendo of America is planning to celebrate with a promotional tour - it makes sense, some people play the game, you potentially get local news showing up, and you can share photos of gamers smiling while playing the game. Marketing 101. In any case, the tour will take in five stops over the next few weeks, all in the US. Details are below. Located at 5 Towers at Universal CityWalk. Located in Chevy Park Plaza (enter at gate 11), across from the Chevy Ride & Drive. Located in Polk Bros Park, Navy Pier’s front gateway, between Illinois and Grand avenues. Located below the “Rocky Steps” of the Philadelphia Museum of Art. In all cases there'll be photo opportunities with a Mario mascot and a chance to try the game. The New York stop will be a bit different, tying in with a midnight launch at the Nintendo NY store; "the first 200 people in line will gain access to the event and be the first to purchase the game at midnight." Weary old perspective aside, we can imagine this trailer will be pretty cool for young kids to see. Will you be heading to any of these stops? 5 locations in the US only. They're really going all out. If I don't finally see a Switch ad when this game releases then I don't think I ever will. What happens to stuff like this when they're finished promoting the game? Happy to see Nintendo back in Chicago for the third time this year. I am going try to make it and get a try of that demo. Man! I'm only a 3 hour drive from Dallas, but why is it on a Wednesday?! Why not Saturday? Of course, I guess, the OU/Texas game is the 14th so they avoided that. Demos anyplace?! All I ever see are video advert kiosks. I'd like to actually try, & play an NS. For video games, & pcs, I prefer to have hands-on before I buy. This will be nice for kids especially, as well as anyone anticipating this game. Darn it!!! I'm going to be at Universal on October 10th, but Universal Orlando! @rdrunner1178 Fellow Austinite? I was planning on going myself until I saw that it's in the middle of the work week, haha. Yeah. No, I'm actually outside of Oklahoma City. So I root for that "other team". I live within a short drive to Universal Studios LA and I am tempted to go, but its in the middle of the day, when I am at work...man, am I tempted though...may still go. US citizens complaining that this does not stop in their city. What about people outside the US? We don't even get this tour. To the US people complaining, being in the same country is closer to this than being outside thr US. You need to accept you have it better than the non US citizens here. This is just Nintendo appeasing the US yet again at the expense of everyone outside the US. Well, it looks like I'm heading over to the Texas State Fair after class.